Every business owner, small and large, has hopes that each person who is casually browsing their website will turn into a lead. While this is obviously not the case, there are some steps you can take to increase your conversion rate and optimize your website for leads. There is no one secret step that will magically turn website visitors into leads. It is a process that requires strategy and testing in order to optimize the site to produce leads. Having a functioning website is not enough. It takes planning and effort to make your site work for you. The first step to optimizing your site for lead generation is to produce a steady stream of quality content that your audience wants to read. Each page of your site, including blog posts, should be optimized with keyword phrases your prospects use to find the answers they’re looking for. 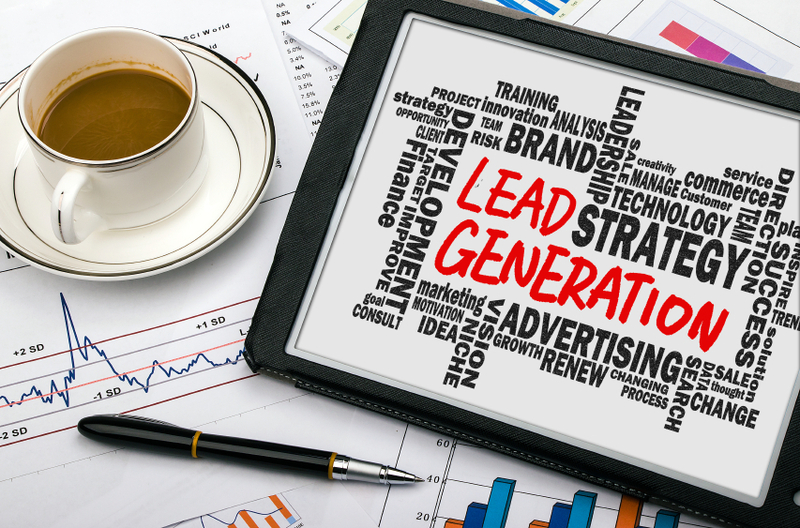 How does optimizing for keywords produce leads? When you address the problems and frustrations prospects have when dealing with your industry, and provide the solutions they’re looking for, they’re much more likely to ask for more information or register for more content from your site. 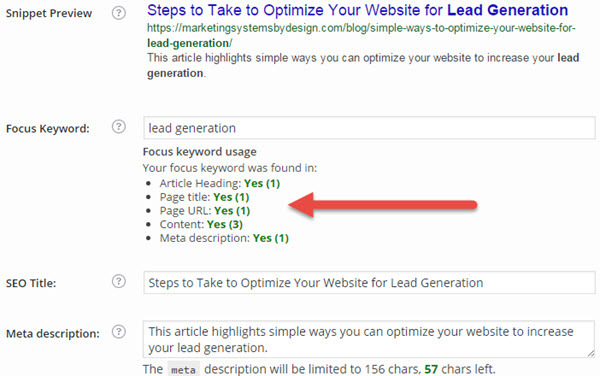 Here is an example of how this blog post was optimized for SEO. This helps your prospects find the content, but your content now needs to convert them to a lead. Assuming you’ve produced content that is engaging and educational for your prospect, the next step is to have a call to action. And the perfect place for that is at the end of your blog posts. For instance, in this blog post about getting more interaction on Twitter, I’ve included a call to action regarding the social media service we offer, in order to help busy business owners systematize their social media content. 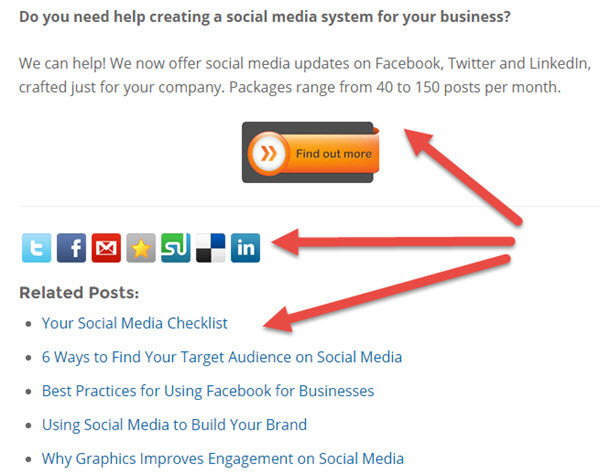 Another CTA to include in your blog posts are social media sharing buttons and Related Posts. The social media sharing buttons encourage readers to share your content, giving you even more potential leads. And the links to Related Posts encourage readers to stay on your site to read even more great content. The more engaged they are with your content, the more likely they are to sign up for one of your CTA’s. Other types of CTAs are “Share This Content” or “Tweet Me” buttons, and a place to subscribe to your newsletter, sidebar ads, and blog subscription links. For an “in-your-face” way to increase leads, you can install a pop up that won’t let users continue until they have either subscribed or exited the window. Even though most people aren’t crazy about these forms, studies still show they are very effective — as long as you have a compelling offer. 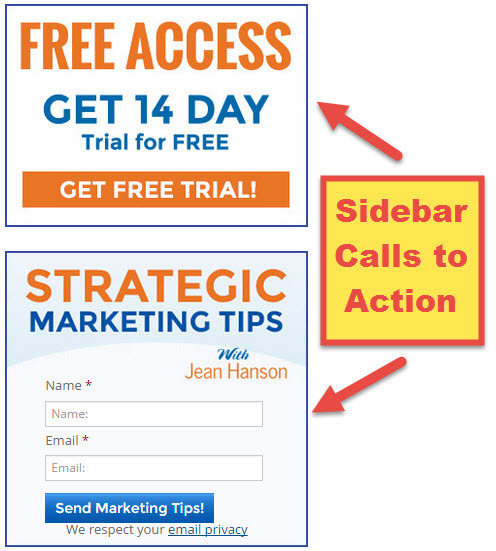 To prove my point, at The Janitorial Store, we changed our call to action pop-up from an eBook to 4 popular downloadable templates that we’d previously only offered to members. Our daily signups doubled immediately by making that one change. Even in today’s digital world, people want to feel special, and the perfect place for this is the thank you page after a call to action form has been completed. Saying “thank you for subscribing” is great, but what can you do to make that experience even better? Showing your prospect that you go above and beyond to make them feel special is even more important than it is to secure their business. That’s because you never know who they might tell about the great experience they had with your business. One idea is to add a bonus they weren’t expecting on the landing page or email that contains their download link. Realize that no matter how optimized your website is for generating leads, or how wonderful and informative your content and landing pages are, your leads will never just magically become clients. It’s going to take time to cultivate and grow your leads into customers. One easy way to do this is to continue to send emails with great content on things that interest them. Getting your name in front of them via your newsletter on a weekly schedule is going to keep your name at the front of their mind. Additionally, you want to make sure your content is relevant, timely and promotes your business subtly but effectively. For example, in a recent issue of Trash Talk, we featured a video called Look For These 5 Skills When Hiring Cleaning Technicians. The call to action for that video was our downloadable product, How to Hire STAR Employees for Your Cleaning Company. If you start with a number of effective Calls to Action strategically placed throughout your website, make it a great experience every step of the way and then cultivate your leads. Keep in mind that 50% of leads are qualified but not yet ready to buy (Source: Gleanster Research). So don’t blow your opportunity to turn your website visitors into faithful customers by optimizing your website for lead generation and nurturing them until they’re ready to buy. If you are serious about optimizing your website for lead generation and working with a marketing company that will help you make sense of it all, sign up for the Free Marketing Audit, which includes a website analysis and competitive analysis.